Panionios ON Telecoms Athens (A1) inked 31-year old American swingman Muhammad El-Amin (196-95kg-87, college: Stony Brook). He started the season at Qatar Club in Qatari D1 league. In two games he recorded very impressive stats: 17.0ppg, 3.0rpg, 5.5apg and 1.0spg this season. The last season El-Amin played at Sopron KC (A Division) in league where in 27 games he averaged remarkable 15.9ppg, 4.4rpg and 5.2apg. In 2013 (three years after he left the college) El-Amin was drafted by Los Angeles D-Fenders (D-League) in fourth round (57th overall). 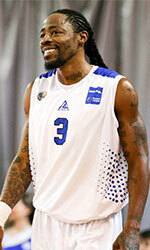 The former State University of New York,Stony Brook staris in his ninth season in pro basketball. Among other achievements his team made it to the Gulf Club Championships Semifinals in 2016. El-Amin received also Eurobasket.com Greek A1 League All-Imports Team award back in 2015. He is a very experienced player. El-Amin has quite traveled the world as his pro career brought him to seven different countries on four different continents (Europe, Asia, Latin America and of course North America). El-Amin has played previously professionally also in Argentina (Atenas), Israel (Maccabi Kiryat Gat), Italy (Deco and FCM Ferentino), Ukraine, Greece (Apollon Patras, Nea Kifisia and Kymis), Hungary (Kormend and Alba) and Qatar (Al Sadd). His game is described as: El-Amin is a highly athletic wing with an exceptional outside shot … has the size and ability to get to the rim while drawing contact … an explosive scorer who loves to have the ball in his hands … he is a strong defensive player who is very active at both ends of the floor.